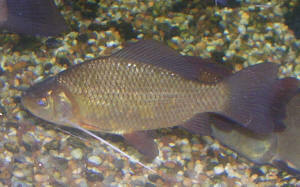 The crucian carp (Carassius carassius) is more closely related to the goldfish than it is to the true carp Cyprinius carpio. For a long time it was assumed that the crucian carp was the ancestor of the goldfish in much the same was as the true carp was the ancestor of the koi carp. In recent years this hypothesis has been rejected in favour of a derivation very largely from Carassius gibelio, the Prussian carp, though perhaps with other Carassius species involved somewhere along the line. Nontheless, the crucian carp and the goldfish are genetically compatible and hybrids commonplace, to the degree that wild crucian carps in some places, for example in England, are almost certainly hybrids between the two species. As pond fish their care is essentially identical to that of standard goldfish types such as comets and shubunkins, and any pond adequately for maintaining pond fish should be more than acceptable to these tolerant fish. As with goldfish, water chemistry and temperature aren't critical issues provided extremes are avoided. They can tolerate summertime temperatures up to 86Ë°F/30Ë°C without problems, and during cold winters will become torpid and rest under the ice provided the pond is deep enough for them to do so--in other words, the pond is at least three feet deep. Moderately hard to hard, neutral to basic water chemistry is preferred. In fact crucian carp are studied by scientists because of their incredible hardiness--including an ability to go without oxygen for months during cold weather--but this shouldn't be taken as an excuse to mistreat them. Like any fish, they'll look their best given good environmental conditions and the right diet. Again, what's good for goldfish is good for crucian carp. Plant-based flake and pellets, as well as fresh greens including algae, are favoured. Like goldfish, they can be 'hibernated' through icy winters, and shouldn't be fed once the water temperature drops below 50Ë°F/10Ë°C. Social behaviour also resemembles that of goldfish. They enjoy company of their own kind, but during the spring especially males become frisky and may chase other fish around the pond. 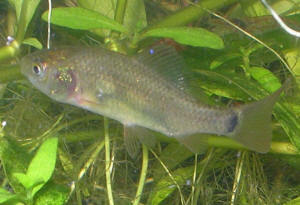 Otherwise peaceful and harmless towards other pond fish.